I’ve found holy grail, staple products in several skincare categories, but when it comes to facial cleansers, I’m stumped. Most cleansers are either too stripping, don’t feel “cleansing” enough or don’t control breakouts the way I expect. My shower is loaded with several test cleansers, but the one I tend to reach for in the morning is Juice Beauty’s Cleansing Milk, a gentle, non-foaming wash that gives my pretty-clean morning skin a nice shot of moisture. While I’m not exactly of the philosophy that we can forgo cleansing in the morning (most of us sweat at night or — gasp! — go to bed without washing our faces), I do believe that most of us can probably get by with a gentle cleanser that refreshes our skin in the morning and jump-starts it for toners, serums and facial oils. That’s why I’m drawn to Juice Beauty’s Cleansing Milk during my morning shower. It’s creamy and feels almost like a moisturizer as I massage it onto my face, and it rinses away easily while leaving a light balmy layer of protection on my skin. I’ve used it at night before — just to test it against a layer of everyday makeup — and while it could cut through a bit of it, I wouldn’t recommend it as your sole cleanser for makeup removal. Also, I like to defend my skin with acne-fighting cleansers and treatments at night, and I can’t say that Juice Beauty’s Cleansing Milk is totally packed with acne-fighting ingredients that have worked for me (though it does contain my beloved frankincense oils!). So, Juice Beauty Cleansing Milk’s bottom line for me? It’s a maybe repurchase. I shelled out just $22 for this pump bottle, and it’s lasted a good amount of time. Once I finish it, I may move on to another cream cleanser just to see what else is out there, but I’d definitely recommend Juice Beauty Cleansing Milk as a budget-friendly, widely available option. 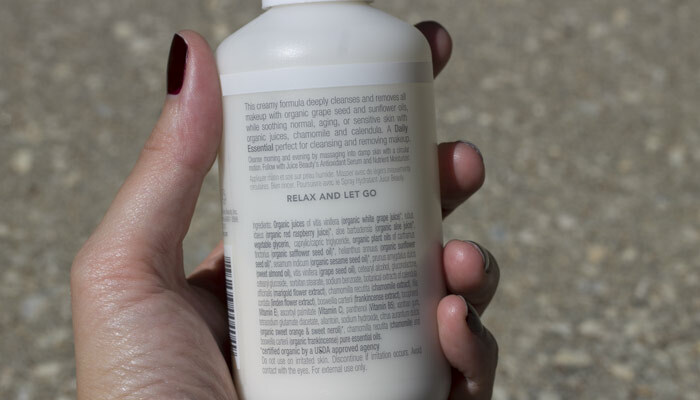 Have you tried Juice Beauty Cleansing Milk? What are your favorite cream cleansers? Do you use different cleanser for morning and night? Tell me in the comments section!